Click here to download a .pdf of these instructions. The Pearl Fincher Museum of Fine Arts is located on Cypresswood Drive near the intersection with Stuebner-Airline. Buses can turn off of Cypresswood Drive into the driveway between the Cypress Creek Christian Community Center and the Museum. If buses take this route, they must drive past the museum and library, and into the County Parking Lot to turn around. After turning around, the bus would go back down the driveway in the opposite direction and pull up to the museum on the right. This way the bus is facing the appropriate direction (toward Cypresswood Drive) and passengers can unload the buses without crossing the street. Depending on what direction they are coming from, the bus drivers may choose to turn onto York Minister and then turn left into the County Parking Lot. The buses would then turn left onto the previously mentioned driveway and continue past the Barbara Bush Library. Again, this way the bus is facing the correct direction and the students can unload the buses without crossing the street. In this case, the museum entrance will be on the right. 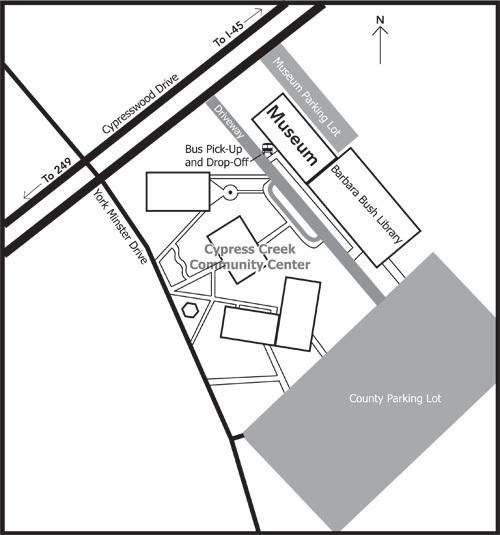 Buses will pull up to the west entrance of the museum, which faces the Cypress Creek Christian Center. The bus door should be facing the museum or east.